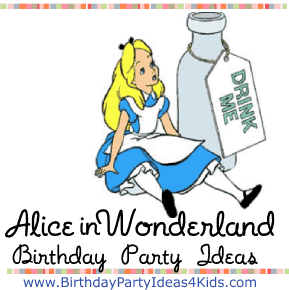 Fun birthday party ideas for an Alice in Wonderland Theme Birthday Party. Choose your favorite ideas and create your own special Alice in Wonderland party. There are quotes from Alice In Wonderland at the bottom of this page to use in your invitations or thank you notes. Invitations with a pictures of a rabbit, stopwatch, Alice, etc. ___________’s party is going to be great! Wear your funniest Alice in Wonderland character costume or a big party hat. The queen requests you RSVP by __________ (date - usually 3-4 days before the party). Set up a tea party for the Alice in Wonderland party guests with mismatched tea cups, saucers, chairs, napkins and tableware. Serve lemonade or Kool-Aid without sugar and let the guests serve themselves from the sugar bowl with either granulated sugar or sugar cubes. For a fun treat set up a chocolate fountain with strawberries, pretzels, marshmallows, etc. to dip into the chocolate. Great game for an outdoor party. Set up the croquet game and play a round or two. Chess is relatively easy to learn ... and kids really like it. Teach them the basics and they can play during the meal. Played like Pin the Tail on the Donkey, except kids will pin a smile on the Cheshire cat face. Trace or draw a large Cheshire Cat onto poster board. Cut out big smiles (matching the smile of the cat you drew) and cut them out. Number them and place tape on each smile. Blindfold the guests and see who can place their smile nearest to the real one on the cat. Make the kids hurry through it. Continually tell them ... "you're late, you're late! See our Scavenger hunt page for free scavenger hunt lists, set up directions and fun and easy ideas for neighborhood, mall and nature scavenger hunts. For this game kids will try and toss ping pong balls into teacups. Set 5 teacups about a foot apart in a line going away from the throw line on the floor. The party guests will stand at the throw line and try and toss a ping pong ball into the teacup closest to them. After they make it into the first teacup then they move on to the next teacup in line and so on until they have tossed their ping pong ball into all 5 teacups. Ping pong balls bounce a lot so you could also use bean bags or small rubber balls for the game. Gather several chairs and put them in a circle facing out - put out one less chair then the total number of party guests playing the game. The children will move around the chairs while music is playing. When the music stops they must hurry and find a chair to sit in. The person who does not get a chair is out and must sit out for the rest of the game. Take one of the chairs away and start the music again. (You can give prizes to the party guests who are out so they will have something to keep them busy while the game continues. ). Keep playing until there are twp guests and one chair left … the child who sits in the last chair wins a prize. Play a mixed up musical chairs game - played just like the musical chairs game above except every round only a chair is taken away - no one leaves the game! The kids must start doubling up and sitting on each others laps trying to fit everyone in the chairs that are left in the game. The last few rounds are the funniest when they have to try and get everyone in the same chair. Fun Alice in Wonderland decorations for an at home party. Set a large table with mismatched teacups and saucers, teapots, chandeliers and mismatched chairs - so that the chair heights are different. Use a white table cloth and scatter decks of cards on the top. Use odd shaped serving dishes with bright colors. Attach small labels (like old fashioned price tags with string) to the food and drinks that say “Eat me” and “Drink me”. Place several clocks that are stopped on the party table (pocket watches too). Paint signs that say “This Way” and “That Way” and hang them throughout the birthday party room. Make a chessboard design on the floor and scatter chess pieces on tables. On the branch of a tree (real or fake) place a Cheshire cat - or use just his grin. Hang Chinese paper lanterns above the table for a festive look. Tie white and blue helium balloons outside on the mailbox. Buy a child’s tunnel from the toy store and place it leading to the front door. Place a sign that says “Enter through the rabbit hole”. Guests have to crawl through the rabbit hole to enter the party. 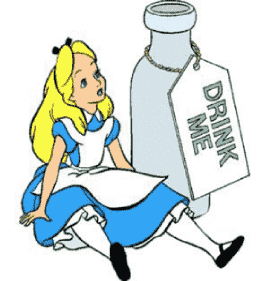 When birthday party guests arrive for the Alice in Wonderland party they can make a nametag for themselves. Spell their name backwards on the nametag and them let them decorate it. Have the guests use their backwards names for the rest of the party. For example: Mary would be spelled Yram. See our other fun party icebreakers. Make a fun Alice in Wonderland craft that will let the party guests take home a piece of the party. Set out unpainted wooden picture frames. Guests can paint and then decorate them with blue paint, light blue or yellow boa feathers, jewels or ribbon. Decorate cupcakes with different colored icing, sprinkles, candies and writing gel. Decorate photo frames with designs from Alice in Wonderland. Have a mad hatter's tea party. Small sandwiches cut in shapes of hearts, clubs, diamonds or spades with shaped cookie cutters. Pink lemonade (don’t add sugar - let them add it themselves using sugar cubes or the sugar bowl). Pepperidge farm shortbread cookies - the ones with the card imprints on them.